We are initiating coverage of Centaurus Diamond Technologies, Inc. (CTDT). CTDT produces synthetic diamonds for industrial use. The patented process was designed by the founder who is one of the most respected and successful engineers of the past half century. Check out his bio and you will see why. No joke. Could be a real nice hit. Centaurus Diamond Technologies, Inc. plans to fully commercialize its proprietary, cost-efficient and high-volume diamond production method to provide industrial quality diamonds. The Company's patented technology enables the production of "cultured" diamonds that are chemically, atomically, and structurally identical to natural diamonds. The Gemological Institute of America has tested the Company's "cultured" diamonds and has confirmed that they are diamonds according to their testing protocols. 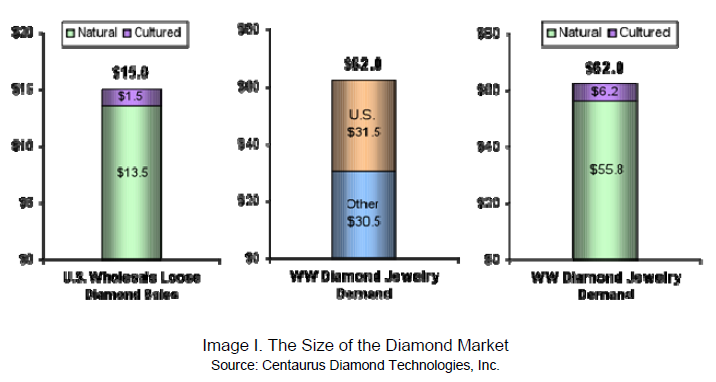 Centaurus Diamond Technologies, Inc. is positioned to introduce a unique, high-volume diamond production method to provide high-demand, industrial quality diamonds to companies around the world. The estimated size of the market is roughly $15 billion. Centaurus’ patented processes convert carbon into cultured diamonds that are chemically, atomically, and structurally identical to natural diamonds. Designed by one of the most respected and successful engineers/inventors of the past half century, CTDT is poised to make waves in the market. Despite creating diamonds artificially, CTDT’s product is essentially indistinguishable from natural diamonds. The Gemological Institute of America has tested the Company's "cultured" diamonds and has confirmed that they are diamonds according to their testing protocols. Management will likely provide an update on mass production potential in the industrial and consumer segments before year-end. Once commercialization commences, Centaurus’ process should ensure millions in revenue and favorable gross and operating profitability during the initial diamond deployment period. While the stock will be event-driven over the coming months, we believe that the stock will trade at a premium to its comps in the coming months. Given the likely efficacy of the technology and the market opportunity, along with the present valuation afforded a publicly traded comparable, we believe that CTDT’s shares could reach $1.20 as milestones occur. We rate CTDT Speculative Buy. Leveraging the patents and knowledgebase of its founder, the noted engineer and inventor Alvin Snaper, Centaurus Diamond Technologies Inc. was established to fully commercialize its proprietary, cost-efficient and high-volume diamond production method to provide industrial quality diamonds. The Company's patented technology enables the production of "cultured" diamonds that are chemically, optically, and physically identical to natural diamonds. These man-made or “cultured” diamonds can be sold at retail for a fraction of the price of a natural diamond. The gemological Institute of America has tested the Company's "cultured" diamonds and has confirmed they are diamonds according to their testing protocols. The Company is in the testing phase of its mass production methods and following the conclusion of the testing will move forward in its plans to target the industrial diamond market, given the current favorable supply/demand environment. Industrial diamonds are valued mostly for their hardness and thermal conductivity. Moreover, the industrial use of diamonds has historically been associated with their hardness. As a result, diamonds are the ideal material for cutting and grinding tools. As the hardest known naturally occurring material, diamonds can be used to polish, cut, or wear away any material, including other diamonds. Industrial diamonds are in high demand and are widely used in the defense, technology, and other segments. As the global economy improves, management will likely consider entering the consumer jewelry market as well. In the interim, we expect that progress in mass production development, along with business development, will dominate the Company’s milestones prior to a commercial launch in the coming months. Diamonds are made of carbon and the purer the carbon, the better for the manufacture of a cultured product. Natural diamonds are a crystal, which grows deep underground, usually in close proximity to volcanoes. The method in which diamonds are formed is similar to other crystals, but diamonds require tremendous temperatures and pressures to grow in Nature. As a result, most diamonds come up from very deep within the earth, carried by the lava flows from volcanoes. Diamonds aren’t just a girl’s best friend, they represent a huge market. As one might expect, unlike other commodities, such as most precious metals, there is a substantial mark-up in the retail sale of gem diamonds. Interestingly, South Africa-based DeBeers controls a significant proportion of the trade in diamonds. DeBeers, the world's largest diamond miner, holds a dominant position in the industry, and has done so since its founding in 1888. DeBeers and its subsidiaries own mines that produce some 40% of annual world diamond production. For most of the 20th century over 80% of the world's rough diamonds passed through DeBeers, although that number has declined to below 50% in recent years. In contrast to mined diamonds, synthetic diamonds are manufactured in a laboratory. The gemological and industrial uses of diamond have created a large demand for rough stones. This demand has been satisfied in large part by synthetic diamonds, which have been manufactured by various processes for more than half a century. However, only in recent years has it become possible to produce gem-quality synthetic diamonds of significant production size. The primary methods of producing artificial diamonds are High Pressure and High Temperature (HPHT), and CVD (Chemical Vapor Deposition). The HPHT method is the one used by most synthetic diamond producers today (both for gem use and industrial use). This process artificially recreates how diamonds are created within the body of our planet. A diamond 'seed' serves as the growth template, and then a carbon source, with a catalyst, is added to enhance growth. Once a crystal is established, the original 'seed' diamond is removed, and what remains is an artificial diamond. CVD employs extremely low pressure and high temperature, and is used for coating things with diamond. There remain substantial challenges to realizing commercial growth levels against achieving larger single diamonds using this method. A diamond seed is again employed. The carbon growth medium is supplied in gaseous molecular form. The carbon floods onto the diamond seed and growth ensues. One Firm that seems to be on the cusp of having a real presence as a CVD producer is Scio Diamond Technology Corporation (OTCBB - SCIO - $2.55), a publicly traded peer to Centaurus. Mr. Snaper serves as Chairman and Chief Scientist of Centaurus Diamond Technologies, Inc., overseeing all technical aspects related to ”cultured” diamond production. In addition to holding patents and modifying existing technologies for laboratory-grown diamonds, Mr. Snaper is the developer of the Company’s proprietary technologies for the production of “cultured” diamonds. Throughout his illustrious career, Mr. Snaper has founded numerous companies and held management and engineering positions at; Neo-Dyne Research Inc., where he served as founder and developed and perfected products bases on his patents; at Advanced Patent Technology Inc. where he served as Vice President – Director Research – Corporate Director; at an Independent Consulting Firm where he served as founder and became the first multi-technology Registered Engineer licensed in California; at McGraw Colorgraph where he was responsible for overseeing all foreign and domestic testing of photographic systems; and at Bakelite Division of Union Carbide where he assisted in the development of a pilot plan for plastics manufacture. Mr. Alvin Snaper has served as a Senior Consultant to other major corporations and organizations, including IBM, General Foods, NASA, Boeing, Gillette, Singer, U.S. Air Force, Rocketdyne, General Motors, Lockheed Aircraft, Sanyo, Philips, Gulf Western, Union Carbide, etc. He has been awarded more than 600 patents, many for significant industrial products and processes. Some of his inventions and commercial products include the IBM Selectric Type Ball, Tang, the NASA Apollo Photo- Pack, Coating Process for Gillette Razor Blades, and the Electrostatic Painting Process & System for Auto Components Assemblies for General Motors, to name a few. Mr. Alvin Snaper holds the single honor and individual distinction of being recognized with 'Best Patent of the Year' award by Design News magazine, and is the author of numerous technical and scientific papers. Alvin Snaper is or has been a member the following professional societies and organizations: Who's Who of American Inventors 1990-1991; VIP Electronic Improvement Program; and the American Ordnance Association. He is a former consultant in ultrasonics to the Library of Congress, Armed Forces Communications and Electronics Association, International Scientific Society and The Society of Photographic Instrumental Engineers. Mr. Snaper is a Professional Engineer (“P.E.”) and a B.S. graduate in Geo-Science at McGill University in Montreal, Canada. He is also a member of several professional societies, author of numerous articles and technical papers, and the only multiple award recipient of Design News Magazine “Best Patent” award (four total). After graduation, he accepted a position as GIA Resident Instructor of Colored Stones and Gem identification (August 86 through September 88). In addition to his Gem Industry academic qualifications, he has also been a wholesale dealer of one-of-a- kind gems, focused on precision cut colored gemstones for the designers, and diamonds larger than one carat. He is a qualified gem cutter with expertise in precision faceting of colored gemstones (Cutting Edge Award winner), diamond analysis for re-cutting and manufacturing diamond rough. He continues to act as a gemological consultant, providing services for both commercial and private clientele and his corporate clients have included Kennecott Minerals, D. Swarovski & Co., Chatham Inc.
John Davies has a distinguished career in development of technologies including geo-electric instruments, pattern recognition and prediction, signal decomposition and processing and novel material compositions with patenting and copyrights. He holds a B.Sc. in physics and Mathematics from the University College of Wales and a M.S. in geophysics from the California Institute of Technology in Pasadena. He holds a Ph.D. in Geophysics and Astronomy from the University of British Columbia, Canada. His clients include British Petroleum, State of Nevada, Cominco, Government of British Columbia, Amoco, USAF, ARPA, Bank of America and numerous universities in the US and Canada. Arthur Ackroyd has a long and varied career in fields of electrical engineering. He was flight test engineer for Lockheed Georgia involved with introduction of new aircraft into military applications with focus on avionic systems and flight controls. He was in senior management at Emerson Electric with focus on development of new business opportunities in the aerospace and communications industries. At Bendix Aerospace he was marketing manager responsible for 7 European divisions. His product range responsibilities included guidance and flight control systems, chemical and environmental systems, biological and meteorological systems and army field communications. Thereafter he established a UK based consultancy, TMS International, and developed business interests in many areas worldwide including the UK, Nigeria, Bangladesh, Sri Lanka and America. In our view, CTDT has advantages over other companies in the space. For example, the long histories of successes of its founder, strength of the technology and business expertise of its team are major plusses in Centaurus' favor. While management has elected not to provide significant details on its production methods for competitive reasons, based on our due diligence, we believe that the method is highly efficient, timely, and cost-effective. As a result, we believe that CTDT will likely trade at a premium to other players in the space in the coming months. In our view, CTDT’s biggest risks are twofold. First, the Company needs to demonstrate it can consistently and profitably mass produce artificial diamonds for industrial use. Second, it must execute its sales and marketing plan. We believe that CTDT will be very successful in its development efforts but understand that the timing of the start of commercialization could push meaningful revenue generation out to a later date, or in a smaller initial ramp, thus impacting the Company’s revenue ramp or time to profitability. Competition from larger firms or even from newer entrants is a typical concern and is also consistent with firms of CTDT’s size and standing. Designed by one of the most respected and successful engineers/inventors of the past half century, CTDT is poised to make waves in the artificial diamond market. Management will likely provide an update on mass production potential in the industrial and consumer segments before year-end. Once commercialization commences, Centaurus’ unique process should ensure millions in revenue and favorable gross and operating profitability during the initial diamond deployment period. While the stock will be event-driven over the coming months, we believe that the stock will trade at a premium to its primary comparable, SCIO, which trades a at 50% premium to CTDT, due to the likely efficacy of the technology as compared to SCIO. Therefore, we believe that CTDT’s shares could reach $1.20 as milestones occur. We rate CTDT Speculative Buy. This Opportunity Research report was prepared for informational purposes only. Goldman Small Cap Research, (a division of Two Triangle Consulting Group, LLC) produces research via two formats: Goldman Select Research and Goldman Opportunity Research. The Select product reflects the Firm’s internally generated stock ideas while the Opportunity product reflects sponsored research reports. It is important to note that while we may track performance separately, we utilize the same coverage criteria in determining coverage of all stocks in both research formats. While stocks in the Opportunity format may have a higher risk profile, they typically offer greater upside as well. Goldman Small Cap Research has been compensated by a third party in the amount of $8, 000 for a research subscription service. The Firm does not accept any equity compensation. All information contained in this report was provided by the Company. Our analysts are responsible only to the public, and are paid in advance to eliminate pecuniary interests, retain editorial control, and ensure independence. Analysts are compensated on a per report basis and not on the basis of his/her recommendations. The information used and statements of fact made have been obtained from sources considered reliable but we neither guarantee nor represent the completeness or accuracy. Goldman Small Cap Research did not make an independent investigation or inquiry as to the accuracy of any information provided by the Company, or other firms. Goldman Small Cap Research relied solely upon information provided by the Company through its filings, press releases, presentations, and through its own internal due diligence for accuracy and completeness. Such information and the opinions expressed are subject to change without notice. A Goldman Small Cap Research report or note is not intended as an offering, recommendation, or a solicitation of an offer to buy or sell the securities mentioned or discussed. This report does not take into account the investment objectives, financial situation, or particular needs of any particular person. This report does not provide all information material to an investor’s decision about whether or not to make any investment. Any discussion of risks in this presentation is not a disclosure of all risks or a complete discussion of the risks mentioned. Neither Goldman Small Cap Research, nor its parent, is registered as a securities broker-dealer or an investment adviser with FINRA, the U.S. Securities and Exchange Commission or with any state securities regulatory authority.